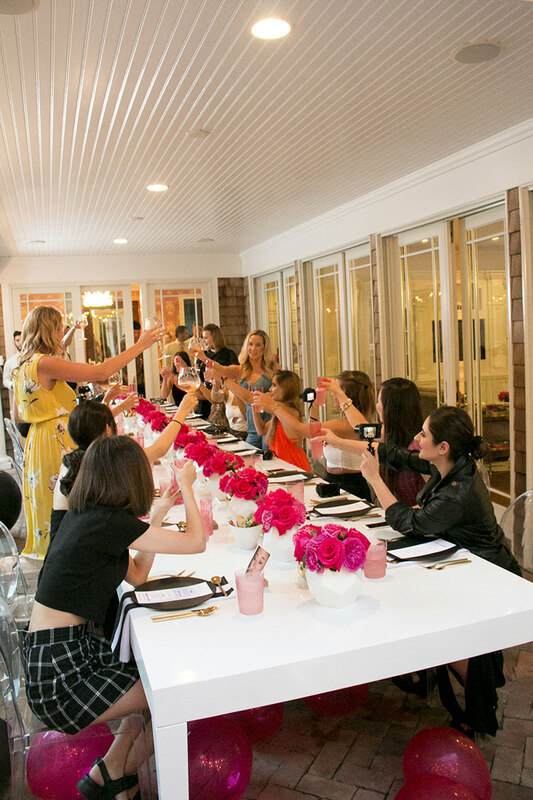 We were honored to be a part of the global Maybelline IT girls Hamptons weekend! After the epic pool party, it was time for the girls to relax while we changed over the house for an evening of fun under the stars. The rain stopped so we were finally able to enjoy the gorgeous yard.As the ladies entered the house, a 12 foot Step and Repeat was setup, complete with 3D NYC buildings all outfitted with the latest makeup products from Maybelline. Thank you 11th Street Workshop for this beauty. The first thing everyone saw as they made their way through the house and onto the back patio was the amazing "Lip and Lash Bar" we created. Under the black and white cabana, we set up a long lacquer table with a light up bulb mirror set on top. What a gorgeous pop of light as the sun went down. Inside the cabana, the girls had access to every Lip and Lash product they could ever want! 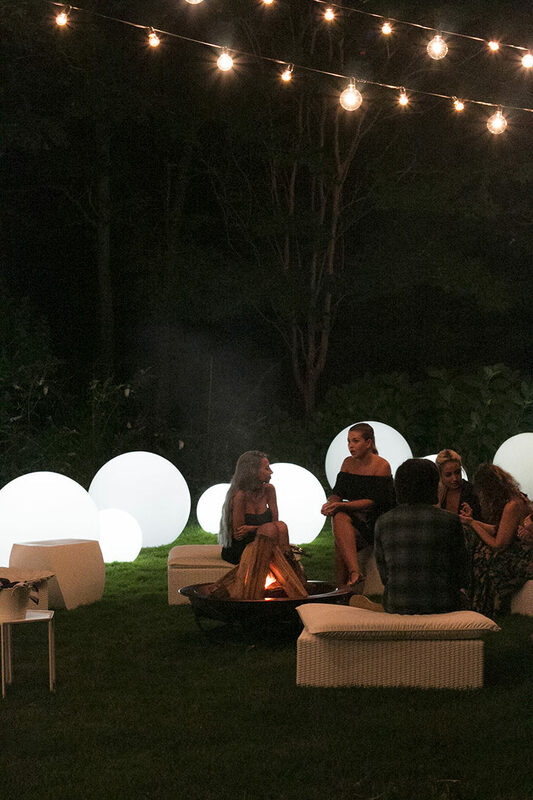 We took advantage of the clear night time skies and setup LED spheres in assorted sizes and strung bulb lights throughout the yard. These gave SO much gorgeous light and created an inviting outdoor space. In addition, we re-positioned all of our outdoor lounge furniture and brought in an oversized fire pit. They loved sitting around the fire, drinking, chatting and enjoying a summertime classic - Smores! As the ladies made their way back into the house, they found a sweet NYC skyline candy bar setup in the kitchen. 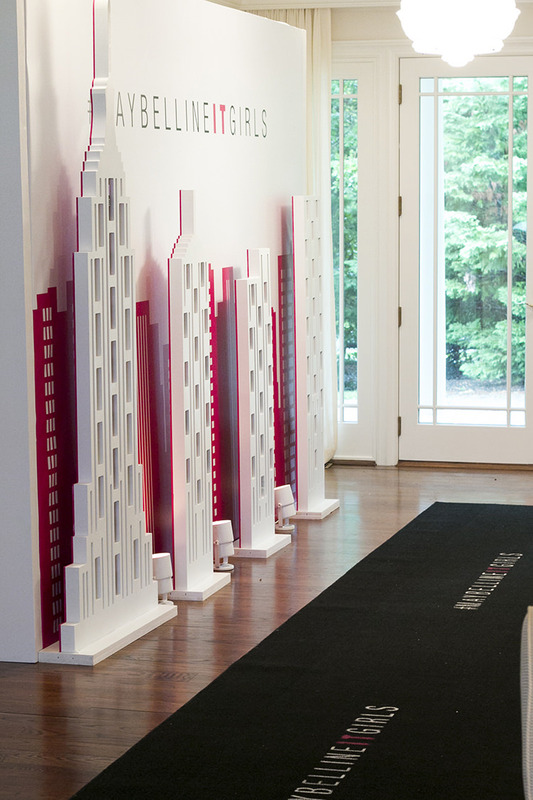 Candies and lipsticks in shades of "Maybelline" hot pink were setup in rectangular glass vessels and set in front of an oversized skyline cutout. We also had smaller skylines constructed and to these we glued more product to create these awesome centerpieces around the house. Pretty gorgeous, right? When it was time to eat, Janet O'Brien catering wowed with some amazing passed apps and an impressive sushi bar. We love food that looks as good as it tastes! With day one complete, it was time for the gals to get some rest as they were in for even more fun on day two... On the second day of their Hamptons weekend, the Maybelline IT girls woke up early to take part in a NIKE workout session at the house. After a great sweat session, they changed into their cutest boating attire and spent the day on a catamaran that took off from Sag Harbor. Not a bad day so far! While they enjoyed the day, we were back at the house setting up for the elegant dinner party that awaited them that evening. We started with gorgeous white lacquer tables and layered on matte black plates, gold cutlery, pink glassware, black and white striped napkins, gold and white vases and of course bold fuchsia flowers. Ghost chairs were the perfect compliment to this tablescape. Details Details Details! In lieu of traditional place cards, I thought it would be so fitting to use a photo from each girls' instagram account to serve as their seating card. How amazing did these turn out?? The pictures were printed on card stock and placed into a small wooden block. It's the little details that really pull a table like this together. In addition to the formal seating area, we created a new lounge vignette by bringing out some modern leather couches and chairs and this chic white fireplace. After dinner we surprised the girls with a fun balloon drop from the top balcony! It was the perfect way to end a pretty fabulous few days in the Hamptons with these gorgeous Maybelline IT girls. CHEERS ladies! !